Climeworks direct air capture plant founders Christoph Gebald and Jan Wurzbacher onsite. © Climeworks / Julia Dunlop. Under the 2015 Paris Agreement on climate change, nearly 200 countries agreed to limit warming to “well below” 2C above pre-industrial levels and to aim for no more than 1.5C. The accord also calls for a “balance” between greenhouse gas emissions sources and sinks in the second half of the century, equivalent to reaching global net-zero emissions. Even before Donald Trump said the US would pull out of the deal, national climate pledges, when viewed cumulatively, fell far short of what would be needed, with the carbon budget for 1.5C set to be used up within as little as four years. This has sparked a growing realisation that so-called negative emissions might be necessary to meet the goals of Paris, where an overspend against the carbon budget is paid back by pulling CO2 from the air. Yet direct capture also has an achilles heel. There is a widely held perception that it is extremely costly, in both energy and financial terms. Academic estimates for the cost of CO2 capture, transport and storage, along with regeneration of chemicals used in the process, range from $400 to $1,000 per tonne of CO2. These estimates are based on extrapolating what we know about carbon capture and storage (CCS) at power plants, where CO2 levels in flue gases are much higher than in ambient air. This is often thought to mean that the costs and energy needs for DAC will be many times larger than for CCS. (This view of high costs is disputed, however – see below). The paper says the costs and energy requirements would be “prohibitive” and that research and development is required to bring them down. Its calculations also do not include the greenhouse gas emissions that might be associated with providing the large energy needs of direct capture. The firm is a spin-off from ETH Zurich, founded in 2009 as the brainchild of two students who met at the university: Christoph Gebald and Jan Wurzbacher. In the past two years, Climeworks has grown rapidly, reaching 45 employees today. Its $20m in financing includes $5m in Swiss government grants and $15m from private equity. In fact, this spark remains, as the company is partnering with German carmaker Audi to develop renewable fuels. 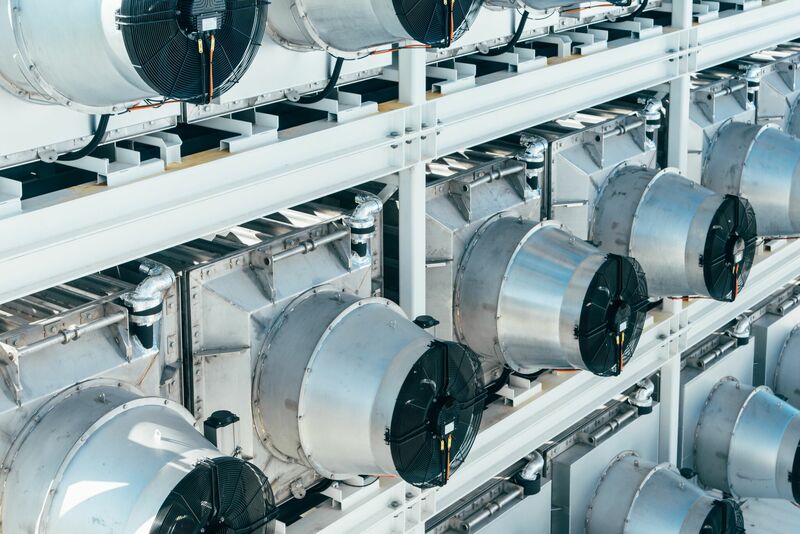 Climeworks’ Hinwil plant cost $3-4m to build and sits in a favourable location, perched on the roof of a municipal waste incinerator, which supplies the low-cost heat that it needs. With a backdrop of green farmland and solar-clad barns, the plant is also a stone’s throw from the Gebrüder Maier fruit and vegetable company, which uses the captured CO2 to boost the growth of cucumbers, tomatoes and aubergines in its large greenhouses. This location, a lengthy tanker-trip away from the usual industrial sources of CO2, such as refineries, presumably adds to the price that Climeworks can command for its product. The market price in Switzerland, for small amounts of CO2, is $200-250/t, Wurzbacher says in a press call. The Climeworks machine consists of a series of three, stacked, shipping container-sized units, each of which contains six CO2 filters. A large hot water storage tank sits alongside, along with two further containers housing control equipment. It works by adsorption–desorption, with fans blowing ambient air over the capture material, which traps CO2 and water, until they are released with heat. Water is a by-product of the process. The machinery is capable of capturing 900tCO2 per year. “With this plant, we can show costs of roughly $600 per tonne [of CO2], which is, of course, if we compare it to a market price, very high. But, if we compare it to studies which have been done previously, projecting the costs of direct air capture, it’s a sensation. “Studies so far assume that what we do will cost $600 per tonne – this is a study by the American Physical Society, and one study by MIT, Stanford and Berkeley even assumed $1,000 per tonne – for plants which are a) industrialised and b) have a much bigger scale, so not one thousand tonnes per year, but a factor one thousand more, so a million tonnes per year. “In order to achieve this factor-three cost reduction, it’s a combination of facts. It will be procurement, so, purchasing larger volumes, it will be professionalising our production infrastructure. The plant which we are starting today is more or less handmade in Switzerland, which is maybe not the definition of the cheapest way of producing things. So we are starting to automate production steps: rather than people, drilling or screwing stuff, that’s like, robots, etcetera, can do this. By going step by step, these means that I just mentioned, we can achieve these cost reductions of a factor of three. Several other firms hoping to commercialise direct capture of CO2 say they can already comfortably beat these costs. Graciela Chichilnisky is chief executive and co-founder of Global Thermostat, which is developing four projects to capture CO2 for use in carbonated drinks. He says: “The vision of our company is to capture [one] percent of global emissions by 2025, which is super ambitious, but which is something that is feasible.” To reach this scale, the company would need to install hundreds of thousands of units, an impossible task on a commercial basis alone. Wurzbacher suggests pioneering companies could help kickstart this by aiming to become not only carbon neutral, but carbon negative. For now, Climeworks is developing niche applications, including CO2 for carbonated drinks and renewable fuels. It plans to open seven facilities over the next two years, including a negative emissions plant in Iceland that will both capture, and then store CO2 underground. (This is a partnership including Reykjavik Energy, CarbFix and the University of Iceland). Stocker says that negative emissions technologies must supplement, not substitute for aggressive investment in energy efficiency and renewables to “replace fossil energy at the fastest rate possible”. This can be compared to the marginal cost of cutting emissions in some models of the future. For example, a recent International Energy Agency report has a power-sector abatement cost reaching $600/tCO2 in 2060. Note: Carbon Brief's travel expenses for attending the Climeworks opening were covered by CleanTech Media, which organised the day on behalf of Climeworks. Carbon Brief retained full editorial control over this article. Technology | February 2. 2017. Technology | August 8. 2013. Technology | November 11. 2013. Technology | November 11. 2017.